Some terrific news was received Friday, as Alex Speier of the Boston Globe reported that Red Sox minor league pitcher Kevin Steen is stable and out of surgery. Steen was involved in a scary car accident Wednesday night. 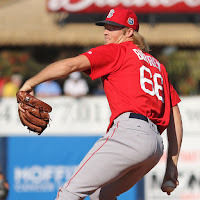 If you still need to catch up on the SoxProspects.com System Restart series, Staff Writer Will Woodward has you covered by outlining the series in Thursday's notes column. One guy highlighted was Ben Taylor, who Speier wrote about in his Red Sox Minor League Notebook. Speier talks about the added incentive in recent years for teams to select college seniors (like Taylor) in the draft. On Friday, Taylor was recalled to Boston for his second stint at Fenway in 2017. Kevin Thomas of the Portland Press Herald wrote about Ty Buttrey (pictured, right) and his successful transition to the bullpen. So far in 2017, Buttrey has a 2.79 ERA and a ridiculous 17 strikeouts in just 9 2/3 innings. Brian MacPherson of the Providence Journal offers some interesting insight on 35-year old PawSox reliever Blaine Boyer. Boyer has a 4.17 ERA in his 10 big league seasons and is coming off a year in which he compiled 66 innings for the Milwaukee Brewers. The Greenville Drive have added 23-year-old Jerry Downs from extended spring training while sending Tucker Tubbs to the Lowell Spinners. With Chase d'Arnaud added to Boston's roster, the Red Sox also optioned Steve Selsky and Robbie Ross Jr. to Pawtucket. Be sure to keep an eye out for the next episode of the SoxProspects.com podcast, which will be coming in the next few days. Lin (pictured, left) is known more for his outstanding defense than his offensive abilities, but you wouldn’t know that from this past week’s performance. Lin has never hit more than two home runs in a full season since turning pro, yet he managed to do that in just this past week. The two home runs now raise his season total to three, which sets a career high in only 15 games played. It was a weather-shortened week with two rainouts, but in the four Sea Dogs games, Lin started and had at least one hit in each, extending his hitting streak to 10 games. The strong week continues a very strong start to the year for Lin, who is spending his third year in Portland. Over his first 54 plate appearances, Lin is slashing .347/.407/.612 giving him a higher 2017 slugging percentage than career OPS at Double-A (.603). Velazquez had yet another strong start this week, throwing a perfect six innings and doing it on only 55 pitches. The offensive support came too late to secure the righty the win, as the PawSox walked off on a two-run Bryce Brentz home run in the bottom of the 9th for the game's only runs. He threw 72% of his pitches for strikes and has extended his scoreless inning streak to 11 innings. The 28-year-old has impressed since signing with the Red Sox out of Mexico this spring - improving his performance in each of his three starts. Overall, over his first three starts of the year, he has gone 1-0 with a 1.72 ERA, 0.72 WHIP, 13 strikeouts to 3 walks, and has held hitters to a .366 OPS against over 15 2/3 innings.